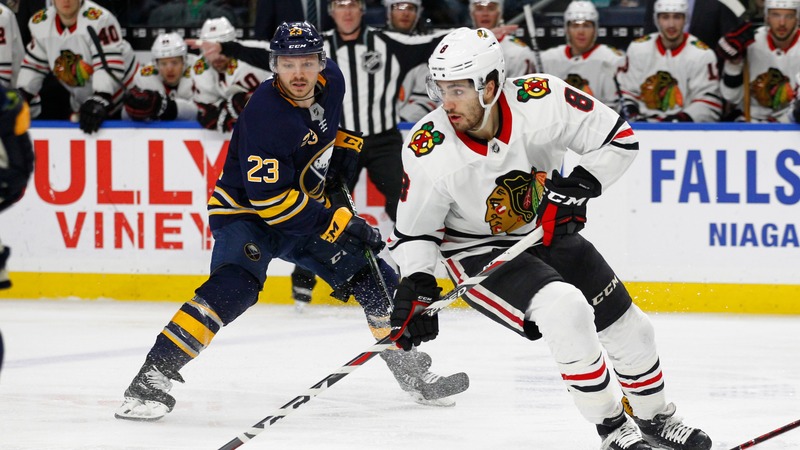 The Blackhawks need scoring from somebody other than Patrick Kane, Jonathan Toews and Alex DeBrincat, and Nick Schmaltz is the prime candidate. *Editor's note: A few hours after this piece was posted, the Blackhawks [traded](https://twitter.com/NHLBlackhawks/status/1066904793724137474) Nick Schmaltz. * The 2018-19 season is only 24 games old, but the Chicago Blackhawks have already dealt with a season's worth of highs and lows. Patrick Kane, Jonathan Toews and Alex DeBrincat came shooting out of the gates, leading the Blackhawks to a strong start. However, as they've cooled to a more reasonable level of productivity (they're still good), a lack of secondary scoring has become a clear issue. Brandon Saad has started to come around of late, and he's now fourth on the team in goals with seven. Kane leads the way with 13 goals, Toews has 11 and DeBrincat has 10. Outside of those four, nobody on the Hawks has more than three tallies. Including Nick Schmaltz, a player they've been pinning high hopes on. That's a problem. Having Kane continuing to play at a high level, having Toews playing his best hockey in years and having DeBrincat [taking the next step](https://www.betchicago.com/alex-debrincat-emerging-star-blackhawks) towards stardom is wonderful. But it's not enough. When they've been at their absolute best, they've had scoring juice up and down their lineup. So the absence of secondary scoring is glaring and, coming off a 52-point season as a 21-year-old last season, Schmaltz's numbers this year jump off the page. Schmaltz has just two goals and only 11 points in 23 games this year. Before Joel Quenneville was let go, he even scratched Schmaltz from the lineup earlier this month in an effort to send a message, having previously used the threat of a scratch to try to jumpstart Saad's season. It didn't seem to do the trick for Schmaltz, who continues to look tentative even as he's in the middle of a three-game point streak. He's had assists in his last three games, but he's not getting into high-danger areas as frequently as he did and he's not scoring goals. Schmaltz has only been able to create 14 high-danger chances so far this season, according [to the stat gurus](http://naturalstattrick.com/playerreport.php?fromseason=20182019&thruseason=20182019&stype=2&sit=all&stdoi=oi&rate=n&v=p&playerid=8477951) at Natural Stat Trick. Last season, he generated 60 of those chances in 78 games. His pace this season puts him on track for 47. That might not seem like a large enough disparity to make a significant difference, but because of the quality of those looks that can easily translate to several goals. And because Schmaltz is struggling to convert even when he gets those looks, it could mean even more. The good news is that there's definitely been some poor luck involved in Schmaltz's slow start. He's only scoring on 6.1 percent of his shots on net after converting 17.8 percent of his attempts last season. Even if that number was higher than what we can expect on average from Schmaltz (he shot 9.1 percent as a rookie), it stands to reason that he's going to be shooting at least 10 percent before the season is over and that should mean a goal-scoring run at some point. Unfortunately, luck alone doesn't explain his struggles. Schmaltz has to be more aggressive/assertive. He's got to provide both goal scoring and help lift his linemates by facilitating. He's not the only one. Artem Anisimov only has three goals and they've counted on him for at least 20 in each of the three seasons he's been here. Rookie Dominik Kahun had such a great camp that the Blackhawks put him on the top line, but his production hasn't been where it's needed to be and he's since moved down the lineup. Even if Schmaltz turns things around and manages to turn in a big season, the Blackhawks will steal need more from those players and from whatever forwards are populating their third and fourth lines. At the same time, Schmaltz feels like a potential tipping point. And at 9-10-5 on the season, they need catalysts right now.